Mellen Center for Multiple Sclerosis Treatment and Research (RJF), Cleveland Clinic, Cleveland, OH; St. Josef Hospital (AC, RG), Ruhr University, Bochum, Germany; Multiple Sclerosis Program (JTP), Baylor Institute for Immunology Research, Dallas, TX; Medical University of Lodz (KS), Lodz, Poland; and Biogen (IC, MN, JR, JLM), Cambridge, MA. Dr. Novas is currently with Alexion Pharmaceuticals, Chesire, CT; and Dr. Rana is currently with Sanofi-Genzyme, Cambridge, MA. Background: Delayed-release dimethyl fumarate (DMF), indicated for the treatment of patients with relapsing-remitting multiple sclerosis (MS), is a disease-modifying therapy with potential immunomodulatory and neuroprotective effects. In clinical trials, DMF was associated with reduced white blood cell and absolute lymphocyte counts. Current US prescribing information recommends obtaining a complete blood count, including absolute lymphocyte count (ALC), before initiating and during DMF treatment. Methods: We conducted an integrated analysis of phase 2b/3/long-term extension studies of DMF in MS (N = 2,470) to characterize ALC profiles. Results: Mean ALCs decreased by 30% during the first year and then plateaued, remaining above the lower limit of normal (LLN). Among patients treated ≥6 months (N = 2,099), 2.2% experienced ALCs <500 mm3 persisting ≥6 months. ALCs remained ≥LLN in 84% and 76% of patients during the first 6 and 12 months, respectively; of these, 0.1% and 0%, respectively, developed ALCs <500 mm3 persisting ≥6 months at any time. Evidence of ALC improvement following DMF discontinuation was observed. DMF efficacy was not substantially different in patients with and without lymphopenia. Conclusion: Lymphocyte monitoring provides effective means for early identification of patients at risk for developing severe, prolonged lymphopenia. Current management strategies for relapsing-remitting multiple sclerosis (RRMS) are focused on prevention of new disease activity via disease-modifying therapies (DMTs).1,2 Delayed-release dimethyl fumarate (DMF; also known as gastro-resistant DMF) is a DMT with potential immunomodulatory and neuroprotective effects.3,4 DMF is indicated for the treatment of patients with RRMS.5 In clinical trials, DMF was associated with flushing and gastrointestinal events as well as reduced white blood cell (WBC) and absolute lymphocyte counts (ALCs).6,7 Current US prescribing information recommends obtaining a complete blood count, including ALC, before initiating and during DMF treatment and considering treatment interruption in patients with ALCs <500 mm3 persisting >6 months5 to minimize the risk of developing severe, prolonged lymphopenia and its potential complications. We conducted an integrated analysis of data from phase 2b and 3 studies of DMF to characterize ALC profiles and to examine efficacy in DMF-treated patients with and without lymphopenia. This analysis is based on data from 1 phase 2b study (NCT00168701), 2 pivotal phase 3 studies (DEFINE [NCT00420212]; CONFIRM [NCT00451451]), and an ongoing long-term extension of DEFINE/CONFIRM (ENDORSE [NCT00835770]). Each study was approved by central and local ethics committees and conducted in accordance with the International Conference on Harmonisation Guidelines for Good Clinical Practice and the Declaration of Helsinki. All patients provided written informed consent. The study designs have been described in detail previously6,–,9; a brief summary is provided here. The phase 2b study and DEFINE/CONFIRM were multicenter, randomized, double-blind, placebo-controlled, parallel-group trials of DMF monotherapy in RRMS. The 12-month phase 2b study included a 6-month placebo-controlled period (part 1) and a 6-month uncontrolled safety extension (part 2). During part 1, patients were randomized equally to DMF 120 mg once daily, 120 mg tid, 240 mg tid, or placebo. In the 2-year DEFINE/CONFIRM studies, patients were randomized equally to DMF 240 mg bid, 240 mg tid, or matching placebo. CONFIRM also included a glatiramer acetate (GA) reference comparator arm (not reported here). ENDORSE is an ongoing multicenter, parallel-group, dose-blinded extension of DEFINE/CONFIRM with up to 8 additional years of follow-up. Patients who received DMF 240 mg bid or tid for up to 2 years in the parent studies remained on the same dosage in ENDORSE. Patients who received placebo (DEFINE and CONFIRM) or GA (CONFIRM) in the parent studies were randomized equally to DMF 240 mg bid or tid. Key patient inclusion criteria for all studies included age 18–55 years, RRMS diagnosis (McDonald criteria10), and an Expanded Disability Status Scale (EDSS) score of 0–5.0. Key exclusion criteria were relapse within 50 days before randomization, treatment with corticosteroids within 30 (phase 2b study) or 50 (DEFINE and CONFIRM) days before randomization, and prior treatment with potent immunosuppressant agents/procedures or MS therapies within predefined washout periods. Exclusion criteria included prespecified abnormal laboratory parameters, including WBC count <3,500/mm3 or eosinophils >700/mm3. Blood was collected every 4 weeks in the phase 2b study. In DEFINE and CONFIRM, blood was collected every 4 weeks for the first 3 months and every 12 weeks thereafter, and within 1 month after study withdrawal or completion if a patient did not continue in the extension. Blood was collected every 12 weeks in ENDORSE. For the analysis of ALCs, the data from all patients exposed to DMF in DEFINE, CONFIRM, ENDORSE, and the phase 2b study, including the 6-month safety extension phase, were pooled to identify all patients with low ALC values on DMF treatment. The data cutoff for this interim report was May 14, 2014; the minimum ENDORSE study follow-up for those patients remaining on study was approximately 3 years. Because the efficacy evaluation was based on annualized relapse rate (ARR) at 2 years vs placebo, only data from DEFINE and CONFIRM were included. The ARR was analyzed in each ALC subgroup (all ALC ≥LLN vs ≥1 ALC <LLN) using a negative binomial regression model adjusted for baseline EDSS score, age, region, study, and number of relapses in the 12 months before study entry. Because there were no cases of ALC <LLN in the placebo group, each of the DMF ALC subgroups was compared with the entire placebo group in the ARR analysis. The ALC subgroup definition used in this analysis (≥LLN throughout and ≥1 ALC <LLN) allowed an adequate sample size in each subgroup for a reliable estimate of ARR reduction vs placebo. 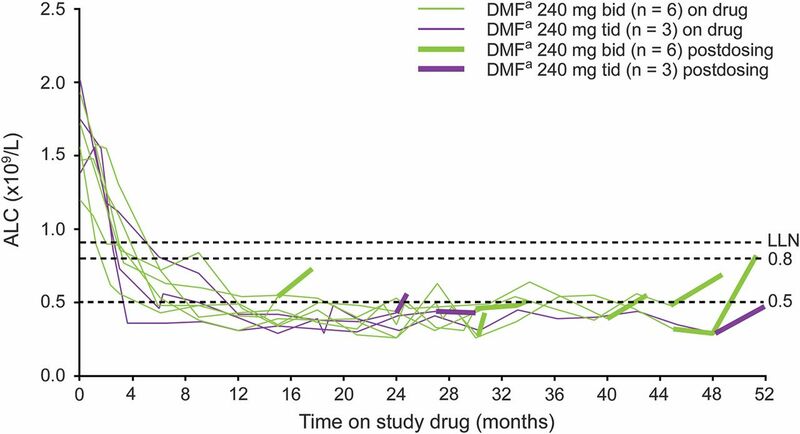 The safety population comprised 2,513 patients with RRMS, including 1,136 patients treated with DMF 240 mg bid, 1,249 treated with DMF 240 mg tid, and 128 treated with lower doses of DMF. Mean (SD) time on study treatment was 3.1 (2.2) years (total of 7,250.0 cumulative patient-years); 74%, 55%, 29%, and 1% of patients were on study treatment for ≥1, 3, 5, and 7 years, respectively (table e-1 at Neurology.org/cp). A total of 2,470 patients (98.3%) had any post-baseline ALC (median [range] follow-up: 39.0 [0.0–90.5] months). Mean baseline ALCs were similar across the DMF treatment arms: 1,870/mm3 with lower doses of DMF, 1,980/mm3 with 240 mg bid, and 1,990/mm3 with 240 mg tid. Mean ALCs decreased by approximately 30% during the first year of treatment and then plateaued, remaining above LLN (910 mm3) throughout the observation period (figure 1A). (A) Patients treated with lower doses of DMFa, DMF 240 mg bid, or DMF 240 mg tid. (B) Patients with ALCs <500 mm3 persisting ≥6 months vs all other patients. ALC = absolute lymphocyte count; BL = baseline; DMF = dimethyl fumarate; LLN = lower limit of normal. aDMF, delayed-release DMF (also known as gastro-resistant DMF). bBaseline (week 0) n includes all patients for whom a baseline ALC value was available. cMean ALCs throughout time are presented out to approximately 5 years (week 240), as this is the minimum follow-up for patients remaining on study in ENDORSE. In most patients in the safety population (61%; 1,533/2,513), ALCs were within normal limits at all visits (CTCAE grade 0). The incidence of worst post-baseline CTCAE grade 1 and 2 lymphopenia was 9% (236/2,513) and 21% (528/2,513), respectively. A further 7% (n = 171/2,513) experienced CTCAE grade 3 lymphopenia and <1% (n = 2/2,513) experienced CTCAE grade 4 lymphopenia. Among patients treated for ≥6 months (N = 2,099), 47 (2.2%) experienced ALCs <500 mm3 that persisted for ≥6 months. For these patients, ALCs generally remained <500 mm3 with continued therapy. ALCs remained ≥LLN in 84% of patients (2,083/2,470) during the first 6 months and in 76% (1,876/2,470) during the first year; of these patients, 0.1% (3/2,083) and 0% (0/1,876), respectively, developed ALCs <500 mm3 persisting for ≥6 months at any time (table 1). The percentages of patients with all ALCs ≥800 or ≥500 mm3 during the first 6 months or during the first year of treatment who developed ALCs <500 mm3 persisting for ≥6 months at any time were similarly low (0%–1.5%). However, for patients with ≥1 ALC <800 mm3 during the first 6 months or first year of treatment, the proportion who developed ALC <500 mm3 persisting for ≥6 months was higher (15% and 11%, respectively). For patients with ≥1 ALC <500 mm3 during the first 6 months or first year of treatment, the percentage of patients who developed ALCs <500 mm3 persisting for ≥6 months at any time was considerably higher (42% and 51%, respectively) (table 1). Mean ALCs in patients with ALCs <500 mm3 persisting for ≥6 months showed a faster decline than those in counterparts without ALCs <500 mm3 persisting for ≥6 months (figure 1B), decreasing to 650 mm3 by week 24 and to 480 mm3 by week 48. Among the 47 patients with ALCs <500 mm3 for ≥6 months, 9 discontinued or completed the study and had limited posttreatment data, as shown in figure 2. Of these 9 patients, 8 had ALCs ≥1 month after their final dose. All of these patients generally showed ALC increases following their final DMF dose. The remaining 38 patients with ALCs <500 mm3 for ≥6 months remained on treatment at the time of this analysis (May 14, 2014). ALC = absolute lymphocyte count; DMF = dimethyl fumarate; LLN = lower limit of normal. aDMF, delayed-release DMF (also known as gastro-resistant DMF). In DEFINE and CONFIRM, the reduction in ARR at 2 years in patients treated with DMF 240 mg bid vs placebo was not substantially different in patients with lymphopenia (≥1 ALC <LLN) compared to those without lymphopenia (all ALCs ≥LLN) (rate ratio [95% confidence interval] vs placebo: 0.472 [0.364–0.611] and 0.547 [0.441–0.679], respectively), figure 3. Results represent ARR reductions in patients in the DMF bid group with lymphopenia (at least 1 ALC <LLN) or without lymphopenia (all ALCs ≥LLN) compared with all patients in the placebo group (pooled analysis of DEFINE and CONFIRM). ALC = absolute lymphocyte count; ARR = annualized relapse rate; CI = confidence interval; DMF = dimethyl fumarate; EDSS = Expanded Disability Status Scale; LLN = lower limit of normal. aDMF, delayed-release DMF (also known as gastro-resistant DMF). bBased on negative binomial regression, adjusted for baseline EDSS score (≤2.0 vs >2.0), baseline age (<40 vs ≥40 years), region, and number of relapses in the 1 year before study entry. A key objective of this analysis was to provide practical considerations for the management of DMF-treated patients with MS by characterizing ALC profiles and examining efficacy in patients with and without lymphopenia. ALC profiles were generally stable throughout time. Mean ALCs decreased by approximately 30% in DMF-treated patients during the first year of treatment and then plateaued, remaining above the LLN throughout the observation period. Among patients treated with DMF for ≥6 months, few (2.2%) experienced ALCs <500 mm3 persisting for ≥6 months, and subsequent ALCs of these patients generally remained <500 mm3. This suggests that ALC <500 mm3 persisting for ≥6 months was an early predictor for those patients at risk of developing severe, prolonged lymphopenia. Our results indicate that patients with ALCs ≥LLN for the first 6 months and first year on DMF treatment are unlikely to have ALC <500 mm3 persisting for ≥6 months. Thus, lymphocyte monitoring provides an effective means for early identification of patients at risk for subsequently developing severe, prolonged lymphopenia. Recent labeling changes in the United States include a recommendation to consider interruption of DMF in patients with ALCs <500 mm3 persisting >6 months to minimize the risk of subsequently developing severe, prolonged lymphopenia and its potential complications.5 Similar labeling changes are pending in the European Union. Although data are limited and based on a small number of patients (n = 9), the current interim data provide preliminary evidence for ALC improvement following DMF discontinuation in patients with an ALC <500 mm3 persisting for ≥6 months. To further study the recovery profile in patients with decreases in lymphocyte counts who are considered at risk for severe and prolonged lymphopenia, a recent ENDORSE protocol amendment stipulated that study treatment must be temporarily withheld if a patient's ALC is <500 mm3 for >6 months. If the ALC remains <500 mm3 for 24 weeks after the last dose, study treatment must be permanently discontinued. It is anticipated that this protocol amendment will enable further evaluation of lymphocyte count recovery after temporary withholding or permanent discontinuation of DMF in patients who develop ALCs <500 mm3 persisting for >6 months. As of August 31, 2015, more than 170,000 patients have been treated with DMF worldwide, representing more than 170,000 patient-years of exposure. Of these patients, 3,887 received DMF in clinical trials, which equates to 8,640 patient-years of exposure (clinical trial exposure data as of April 15, 2015). In this analysis, the overall incidence of serious infections was low, and there was no apparent correlation between the incidence of infection and CTCAE grade ALC (patients with CTCAE grade 3 or 4 ALC did not experience a higher incidence of serious infection than patients with CTCAE grade 0 or 1 ALC). Subsequent to the data cutoff for this interim report (May 2014), a fatal case of PML was reported in a 54-year-old patient with MS treated with delayed-release DMF 240 mg tid in the setting of severe, prolonged lymphopenia (approximately <500 mm3 for 3.5 years).12 In addition, rare cases of PML occurred in the postmarketing setting in the presence of prolonged lymphopenia. Specifically, 2 cases occurred in the presence of severe and prolonged lymphopenia (approximately <500 mm3 persisting for >6 months) and 1 case occurred in the presence of moderate and prolonged lymphopenia (nadir 600 mm3 for >6 months) (Biogen data on file). Aside from rare cases of PML, there is no overall increased risk for serious infections, including other opportunistic infections.13 Rare cases of PML have also been reported with other fumarates14,–,16; however, it is important to note that Fumaderm is a distinct product with different active ingredients and that compounded fumarates are unregulated products that may contain different active ingredients. These products have different pharmacokinetic and pharmacodynamic profiles and may have a differential effect on lymphocytes (Biogen data on file)17; however, one salient feature of these cases is prolonged lymphopenia, as the majority of these cases shared this characteristic. Periodic monitoring of ALCs to identify patients who may have developed severe, prolonged lymphopenia is therefore recommended (as per the label for DMF). Furthermore, health care providers should assess the benefit and risk of continued DMF treatment in patients who experience moderate lymphopenia persisting for >6 months. Immune cell changes are an important component in MS pathophysiology, as the immune system plays a central role in myelin and nervous cell destruction and lesion development.18,19 The beneficial effects of immunomodulatory and immunosuppressive therapies on MS disease activity provide further support to this theory. 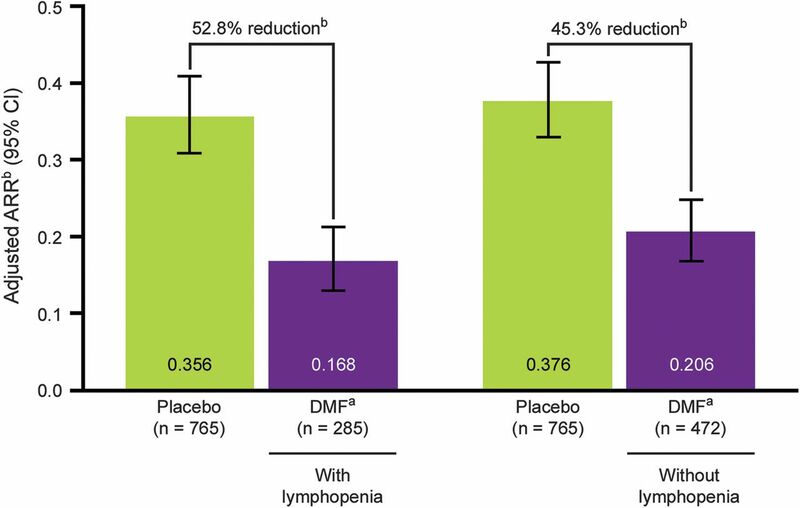 Herein, we noted similar DMF therapeutic efficacy (ARR reduction) in patients with and without lymphopenia, suggesting that lymphopenia is not a primary mechanism for the therapeutic effects of DMF. The underlying mechanism of DMF-induced lymphopenia is not well understood. DMF-dependent lymphocyte reduction has not been observed in any preclinical species, including chronic primate studies, indicating that this phenomenon is specific to human biology. This restriction to humans is a major hindrance to identification and characterization of the underlying molecular mechanisms of lymphopenia. Preliminary findings suggest that DMF affects several lymphocyte populations, most notably CD4+ and CD8+ cells, potentially eliciting a greater reduction in the latter.22,23 However, despite these preliminary findings, the role of lymphocyte subsets in the action of DMF is unknown. Further research is ongoing to determine the link between DMF and lymphopenia, including its effect on lymphocyte subsets and the mechanisms responsible for these effects. The results of this integrated analysis suggest the overall benefit–risk of DMF remains favorable. 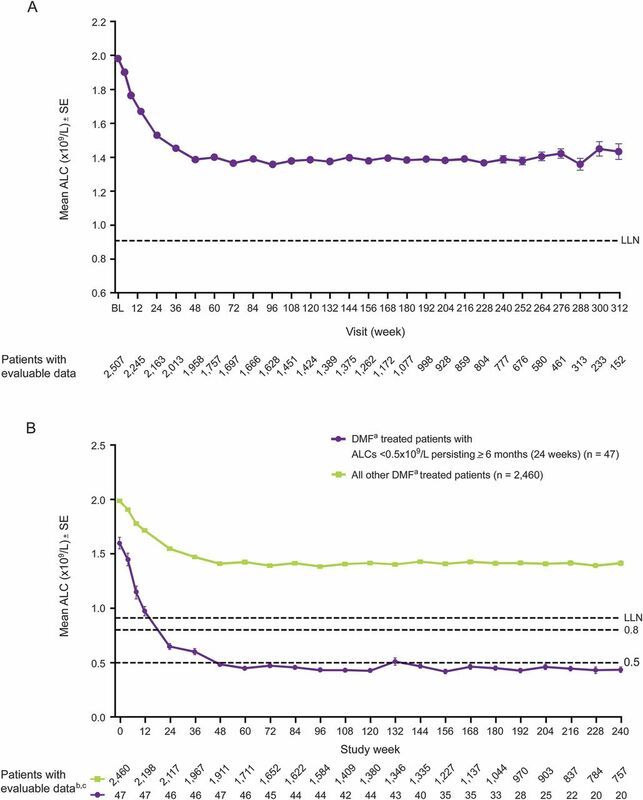 ALC profiles in DMF-treated patients with RRMS were generally stable throughout time. ALC <500 mm3 persisting for ≥6 months appeared to be an early predictor for the development of severe, prolonged lymphopenia in a small number of DMF-treated patients; however, there was no evidence suggesting an association between the rate of serious infections and incidence of lymphopenia. Comparable therapeutic efficacy in patients with and without lymphopenia suggests that lymphopenia is not a primary mechanism of action of DMF. Ray Zhang, PhD, of Biogen provided assistance with statistical analyses. Biogen provided funding for medical writing support in the development of this paper; Julie Adkins and Erin Bekes, PhD, from Complete Medical Communications provided editorial support. Biogen reviewed and provided feedback on the paper to the authors. The authors had full editorial control of the paper, and provided their final approval of all content. Dr. Fox served on the medical advisory committee of the parent study, contributed to the conception and design of the study, participated as an investigator and collected data, interpreted the data, and revised the manuscript. Dr. Chan participated as an investigator and collected data, interpreted the data, and revised the manuscript. Dr. Gold served on the medical advisory committee of the parent study, contributed to the conception and design of the study, participated as an investigator and collected data, interpreted the data, and revised the manuscript. Dr. Phillips served on the medical advisory committee of the parent study, contributed to the conception and design of the study, participated as an investigator and collected data, interpreted the data, and revised the manuscript. Dr. Selmaj served on the medical advisory committee of the parent study, contributed to the conception and design of the study, participated as an investigator and collected data, interpreted the data, and revised the manuscript. Dr. Chang analyzed and interpreted the data and revised the manuscript. Dr. Novas contributed to the conception and design of the study, interpreted the data, and revised the manuscript. Dr. Rana interpreted the data and revised the manuscript. Dr. Marantz provided medical oversight of the study, interpreted the data, and revised the manuscript. R.J. Fox serves on scientific advisory boards for Biogen and Novartis; serves on the editorial boards of Neurology and Multiple Sclerosis Journal; receives publishing royalties for Multiple Sclerosis and Related Disorders (Demos Medical, 2013); serves as a consultant for Actelion, Biogen, GlaxoSmithKline, Questcor, MedDay, Novartis, Mallinckrodt, Teva, and XenoPort; and receives research support from Novartis, National MS Society, NIH, and Consortium of MS Centers. A. Chan served on scientific advisory boards for Bayer, Biogen, Genzyme, Novartis, and UCB; has received honoraria from Bayer, Biogen, Genzyme, Merck, Novartis, Teva Neuroscience, Almirall Hermal GmbH, Sanofi Aventis, and Roche; is author on a patent re: Proteomic profile of NMO; serves as a consultant for Bayer Schering, Biogen, Genzyme, Merck, Novartis, and UCB; receives research support from Bayer Schering, Biogen, Merck Serono, Novartis, Genzyme, German Ministry for Education and Research (BMBF), and Ruhr University Bochum; has participated in medico-legal cases; and served as country lead investigator for phase III DEFINE trial on dimethyl fumarate in multiple sclerosis and as country lead investigator for phase III TEMSO and TENERE trials (teriflunomide in MS). R. Gold serves on three DSMB boards for TEVA and on scientific advisory boards for Biogen, Bayer Schering, and Novartis; has received honoraria from Biogen, TEVA, Bayer Schering, Merck Serono, and Novartis; receives compensation from Sage for serving as editor of Therapeutic Advances in Neurological Disorders and on the editorial boards of American Journal of Pathology, Journal of Neuroimmunology, and Experimental Neurology; serves as a consultant for Biogen, ELAN, TEVA, and Chugai Inc.; and receives research support from TEVA, Biogen, Bayer Schering, Merck Serono, and Novartis. J.T. Phillips has served on a scientific advisory board for Serono and received speaker honoraria from Acorda, Biogen, Genzyme, and Sanofi; serves on speakers' bureaus for Acorda, Biogen, Genzyme, and Sanofi; and receives research support from Biogen and Roche. K. Selmaj serves on scientific advisory boards for Genzyme, Biogen, Novartis, Synthon, Roche, Receptos, and TEVA; has received speaker honoraria from Biogen, Novartis, TEVA, Bayer, Roche, Receptos, and Genzyme; serves on the editorial board of Journal of Neuroimmunology; serves as a consultant for Genzyme, Novartis, Ono, Teva, Biogen, Roche, Synthon, and Merck Serono; serves on speakers' bureaus for Novartis, Merck Serono, Biogen, Bayer, and Genzyme; and receives research support from National Research Center (Poland) and from National Center for Research and Development. I. Chang is an employee of and holds stock/stock options in Biogen. J. L. Marantz is an employee of and holds stock/stock options in Biogen. Full disclosure form information provided by the authors is available with the full text of this article at Neurology.org/cp. Coinvestigators are listed at Neurology.org/cp. Funding information and disclosures are provided at the end of the article. Full disclosure form information provided by the authors is available with the full text of this article at Neurology.org/cp. The Article Processing Charge was paid by the study sponsor Biogen. Garmany GP Jr., et al. Disease modifying therapies in multiple sclerosis: report of the Therapeutics and Technology Assessment Subcommittee of the American Academy of Neurology and the MS Council for Clinical Practice Guidelines. Neurology 2002;58:169–178.
. Multiple sclerosis: current treatment algorithms. Curr Opin Neurol 2011;24:230–237. Effects of dimethyl fumarate on neuroprotection and immunomodulation. J Neuroinflammation 2012;9:163. Fumaric acid esters exert neuroprotective effects in neuroinflammation via activation of the Nrf2 antioxidant pathway. Brain 2011;134:678–692. Tecfidera [package insert]. Cambridge, MA: Biogen, Inc; 2014. Placebo-controlled phase 3 study of oral BG-12 or glatiramer in multiple sclerosis. N Engl J Med 2012;367:1087–1097. Placebo-controlled phase 3 study of oral BG-12 for relapsing multiple sclerosis. N Engl J Med 2012;367:1098–1107. Efficacy and safety of oral fumarate in patients with relapsing-remitting multiple sclerosis: a multicentre, randomised, double-blind, placebo-controlled phase IIb study. Lancet 2008;372:1463–1472. Long-term follow-up of the safety of delayed-release dimethyl fumarate in RRMS: interim results from the ENDORSE extension study. Neurology 2015;84:P7.235. Diagnostic criteria for multiple sclerosis: 2005 revisions to the “McDonald Criteria”. Ann Neurol 2005;58:840–846. National Cancer Institute. Common Terminology Criteria for Adverse Events v4.0, NCI, NIH, DHHS. Bethesda, MD: NIH publication; 2009. #09–7473.
. Assessing PML risk under immunotherapy: if all you have is a hammer, everything looks like a nail. Mult Scler 2016;22:389–392. PML in a patient treated with dimethyl fumarate from a compounding pharmacy. N Engl J Med 2013;368:1658–1659.
. PML in a patient treated with fumaric acid. N Engl J Med 2013;368:1657–1658. van Oosten BW, et al. PML in a patient without severe lymphocytopenia receiving dimethyl fumarate. N Engl J Med 2015;372:1474–1476. Influence of ethyl hydrogen fumarate vs. dimethylfumarate on the development of lymphopenia. Mult Scler J 2015;368(S11):584–585.
. Immunopathogenesis and immunotherapy of multiple sclerosis. Nat Clin Pract Neurol 2006;2:201–211.
. The immunopathophysiology of multiple sclerosis. Neurol Clin 2011;29:257–278.
. Dimethyl fumarate associated lymphopenia in clinical practice. Neurology 2015;84:P3.240.
. Dimethyl fumarate associated lymphopenia in clinical practice: implications for informed patient management. Presented at the Consortium of Multiple Sclerosis Centers (CMSC) Annual Meeting; May 27–30, 2015; Indianapolis, IN. The effect of dimethyl fumarate (Tecfidera) on lymphocyte counts: a potential contributor to progressive multifocal leukoencephalopathy risk. Mult Scler Relat Disord 2015;4:377–379.
. Dimethyl fumarate effects on lymphocyte phenotype. Presented at the Consortium of Multiple Sclerosis Centers (CMSC) Annual Meeting; May 27–30, 2015; Indianapolis, IN.